Who doesn’t like those hot peanuts to pass time? Let’s meet Mr.Selvam, hailing from a village in Theni, Tamil Nadu. He has been coming for Amritavarsham for the past 4 years. 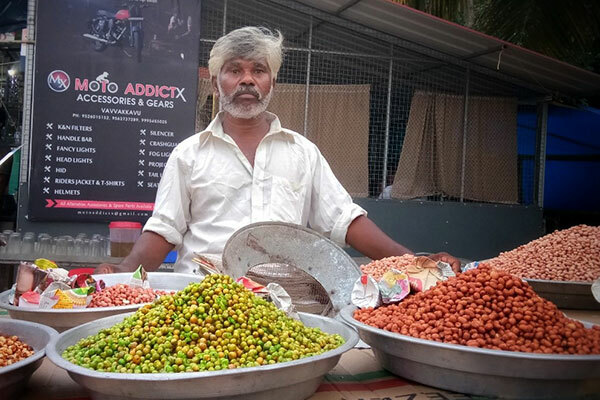 He sets up his peanut cart near to the Engineering College every year. He talks about the first time he came to set up stall along with his brother-in-law. The atmosphere, he says, was unlike any other place he had seen earlier. He says that every year the number of people who arrive for the function kept on increasing and the coordination and planning has never seemed to fail. “It seems like there are more Tamilians and other state people here than Keralites during Amma’s birthday”-says Selvam. Seeing a lot of his natives has made him more comfortable, it is a feeling of being at home. “When we come for Amma’s birthday, we do have some earnings but more than that after Amma’s darshan we return with immense joy” concludes Selvam.